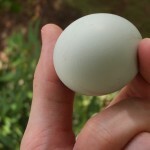 This afternoon, I was pleased to discover that our Ameraucana chicken laid her first egg, and as expected, it’s blue! As you may recall, in posts dating back to July (Chicken Drama I and II), we’ve been having trouble creating harmony between our only surviving chicken from the original three, Marcia, and our three newest chickens (the kids). After a few days of the four of them living together, it became clear that the Ameraucana (the grey one) was receiving the brunt of Marcia’s negative attention. Even after we separated Marcia from the other three, the Ameraucana’s younger “siblings” continued to pester her; as a result, we separated her from Marcia and the younger two for almost a month. Hence, we’ve been worried that all of this drama would delay the start of her laying. By my calculations, she is about 20 weeks old. Those of you more knowledgeable than I can tell me if that’s about the right time for her to begin laying. 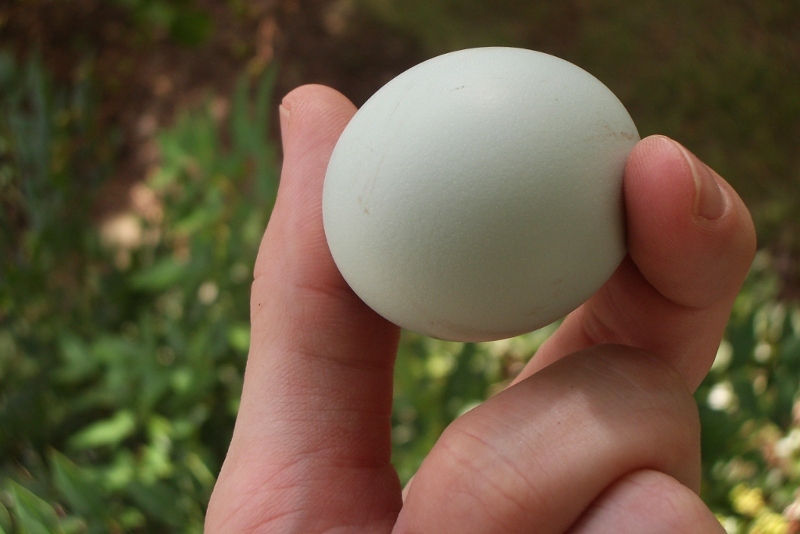 In my most recent post, I noted that we had each tried to predict the date on which the first of our youngest three chickens would lay. Today, Oct. 9th, is closest* to Caleb’s prediction of Oct. 10. Congratulations, Caleb! You won…um…we never settled on a prize. Perhaps you can eat the first egg! *If we were playing by “The Price is Right” rules, Whitney would be victorious with her guess of Oct. 3.